Snuggle up for time together with God and your little one! The Beginner’s Bible 365 Devotions for Kids contains 365 simple daily devotions filled with Scripture and prayers that are the perfect, Christ-centered building block for young children. Featuring original content based on the bestselling The Beginner’s Bible®—a favorite with young children and their parents since its release in 1989—The Beginner’s Bible 365 Devotions for Kids is filled with exciting, full-color artwork and easy-to-read text. 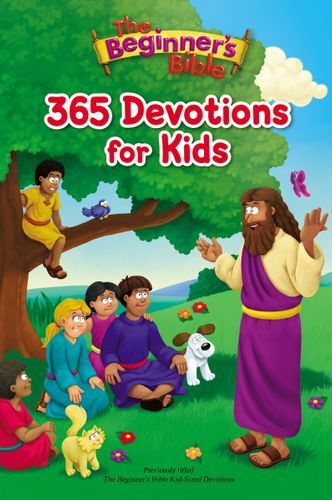 Perfect for children 6 and under, each of the 365 devotions also has a theme clearly connecting the Scripture to the story to the art. The Beginner’s Bible 365 Devotions for Kids is the trusted starting point for children as they develop a stronger relationship with Jesus. Is the preferred devotional for kids to cuddle up with their parents. And is a go-to devotional for Sunday school teachers and day care providers to hold children’s attention at church or daycare.